On that same note, there are some drawbacks you will want to know about if you aren't equipped with a solid internet connection, or aren't fond of the additional subscriptions like Xbox Live Gold and PlayStation Plus. After having played the game with my Nephew tonight I can honestly say it is a blast, just as I had hoped...It is sad knowing we are missing out on the "online" aspects of the game (see almost everything), but I am equally hopeful that my trial of Xbox Live Gold will pan out with the connection and I can move forward to enjoy the rest of the game. Please note that the Split Screen Offline Co-Op is only avaialbe on Xbox One! Speaking of which, let's take a look at the available maps! Oh and what about the pre-order bonus I mentioned that enticed me to commit to GameStop? Well, sadly I didn't check things out PRIOR to entering the code, but it will showcase what is available. 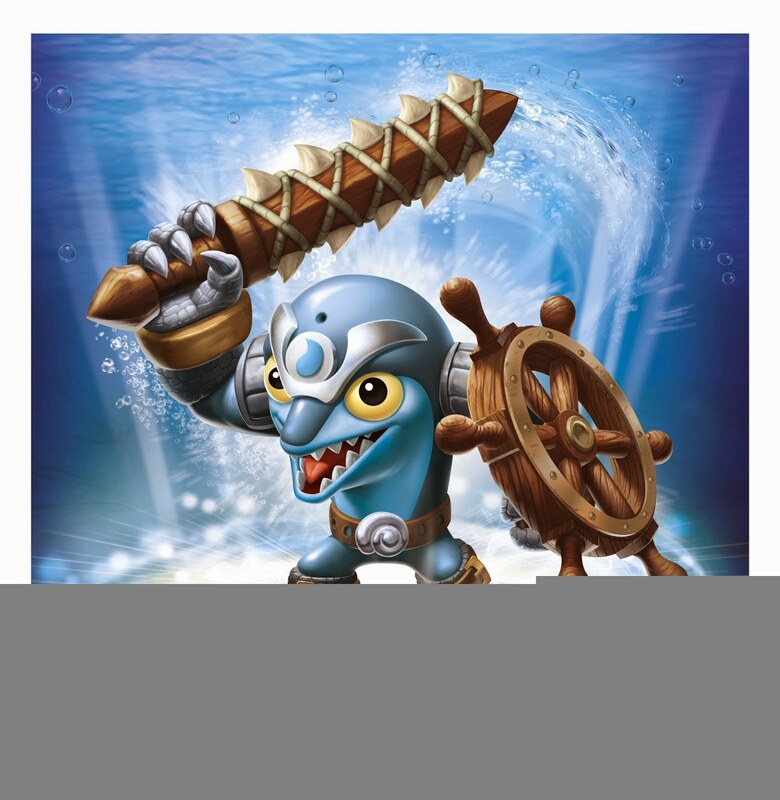 Name that Skylander: New Frito-Lay Promotion Let's You Name a Skylander and Win Big! The person who came up with the winning name/story will be awarded a $100,000 scholarship That is a very big deal! 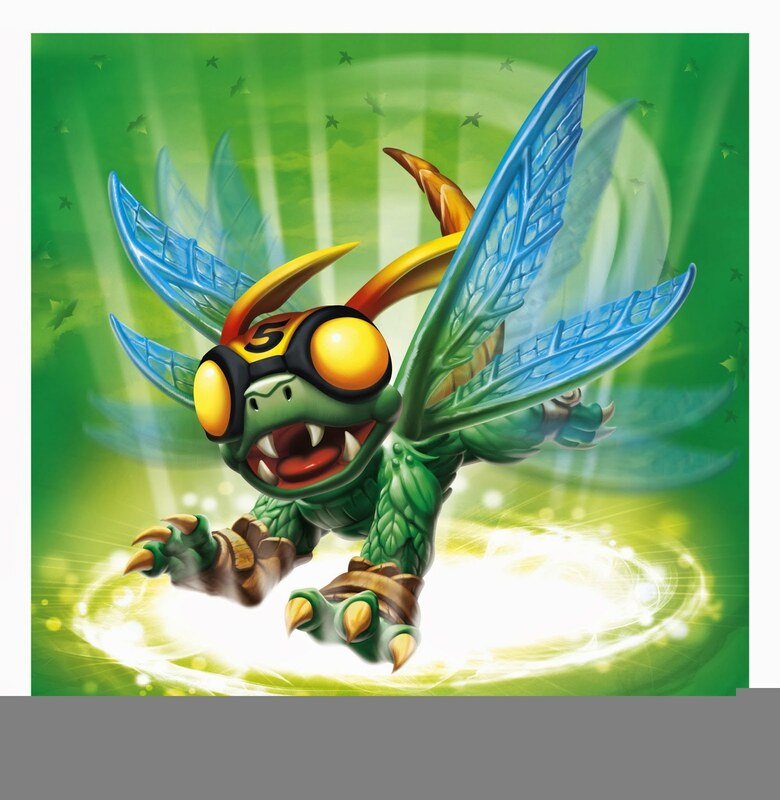 If academics aren't inspiration enough, everyone can take pride in knowing that if their named Skylander wins the character will appear in promotional settings and even in the game. I would assume as a playable character, but that is not etched in stone based on what I have read thus far...That would be insanely cool though. 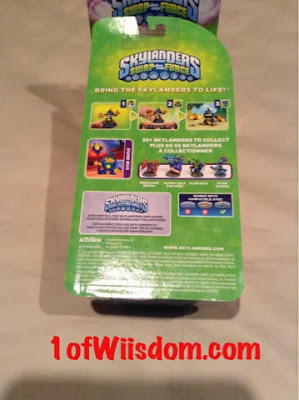 If the contest isn't up your alley, you at least get a look at some potential Skylanders AND you can score some tasty Frito-Lays Multipacks with sweet savings on Skylanders! Each bag will have discounts, so be on the look out! You can find more info and official rules on the website linked above! Good luck!! I have been meaning to post this for a while, but things have been quite busy on my end..plus, the pre-orders went lightning fast (ie I should have pre-ordered on lunch break instead of when I got home). 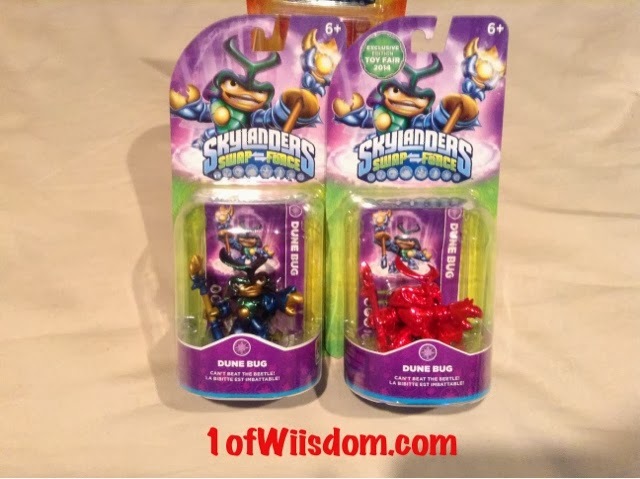 That said, we had a pretty nice reveal of some new Skylanders that will be hitting the shelves soon (although for some folks, "soon" in this instance may not be as quick as you would like). First off, let's go with the solid release date. 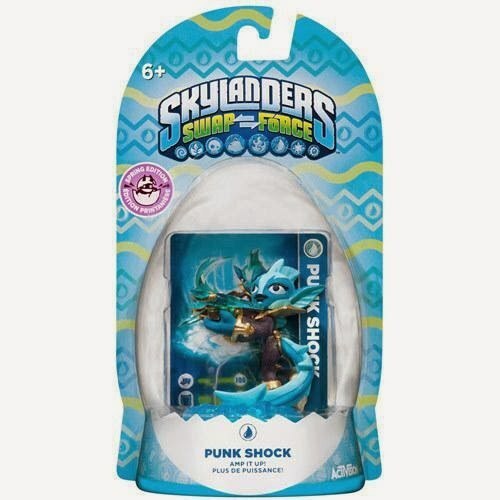 Thanks to Target, we know that they are listing their store exclusive and in-game variant Nitro Freeze Blade with a release date of Sunday, March 23rd, 2014. I've never been a huge fan of Sunday releases, and Target has been hit-or-miss with pretty much all of their exclusives, but I will keep my fingers crossed things go down smooth. You would be wise to start checking the store regularly a week or so out...just in case. I have been looking forward to Doom Stone, Trap Shadow, and Freeze Blade...I think folks have underestimated him based on the performance in my poll. Once he is out, that should change. Given the fact we haven't really seen a "special" figure out BEFORE their standard counterpart (special being in game variant etc, not just LightCore etc), I would have to imagine that standard Freeze Blade should be in the mix around or before this date as well. He looks pretty solid from this box art, but I will hold final judgment for when I see him in person...He joins Nitro Magna Charge as characters treated to the Speed Boost, special paint job, and Target Exclusive status. As always, I recommend you pick him up ASAP to avoid any issues. The first entry should be no surprise given his name, Spring Time Trigger Happy. A lot of people still don't seem to grasp this is an in-game variant! So yes, STTH will look just like his figure in the game...crazy right? The other perk is the Spring Time hat (kind of an Easter Egg with Rabbit Ears) that should be just as impressive as the "Jolly Hat" from Jolly Bumble Blast. Spring Time Trigger Happy's hat is only available via the figure. 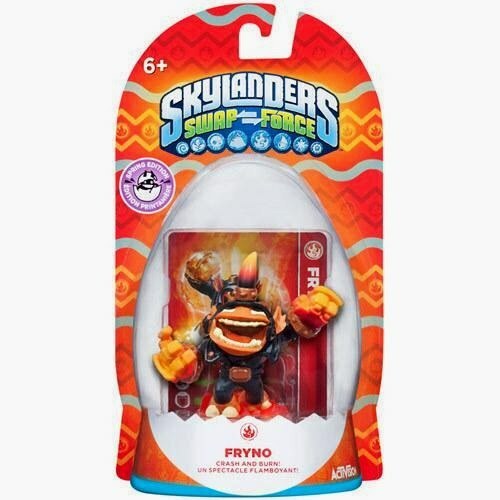 On the same "Spring Edition/Easter Landers" front we have juxtaposed Newlanders in Fryno (Fire Element) and Punk Shock (Water Element). Both should be well received. Likely suspects would be Turbo Jet-Vac and LightCore Bumble Blast...I say that because to me they seem more like "Spring" than a later release that might include warmer characters like Fire Bone Hot Dog etc. Again, that is just my logic and speculation. 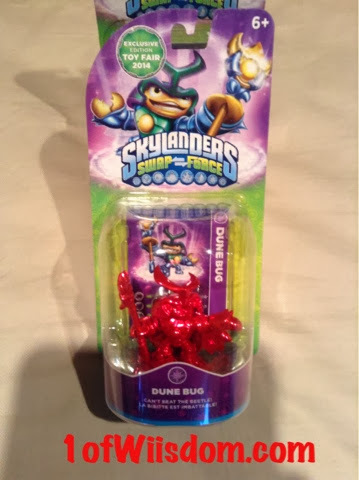 Based on Toy Fair media, it looks like Trap Shadow should be coming out with Freeze Blade or shortly there after...There has been no sightings for Doom Stone. 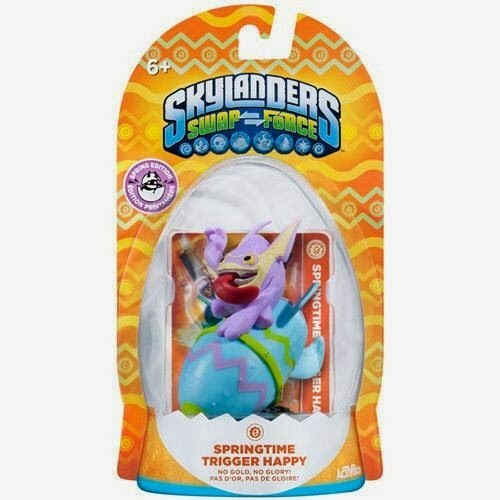 If you are hoping to catch any of these early, here are some links...Keep in mind, I think that they will heavily stock the special "Spring Edition" ones based on what we saw with Jolly Bumble Blast etc...If you have to prioritize one, go with Target's Nitro Freeze Blade. 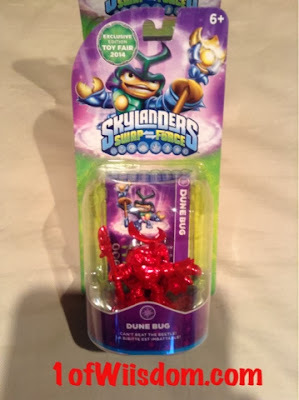 Here is a little Skylanders SWAP Force Showcase where my Nephew and I took some time to see what all the Two Player Battle Modes had to offer. In all the videos my Nephew (thewalkthruking) plays as Slam Bam and I play as Terrafin. Both Skylanders are Series 2 and Fully Upgraded! One of the things my Nephew (thewalkthruking) and I love to do when I've wrapped up a blind playthrough of Skylanders is go back and take on Kaos together. Just as we did in Giants, we opted for a Terrafin & Slam Bam team-up to take on SWAP Force's Super Evil Kaos! The red coloring is definitely a metallic red...It is almost like an anodized finish, although I'm not sure how many of you deal with anodized aluminum fittings. It is a deep, vibrant red...It is not maroon, yet I feel it is closer to that than "lipstick red." You can get a decent feel for it via the pictures and video, but it really would have to be seen with your own eyes to accurately pick up on the color. The entire figure is covered in the red paint...Tip of the top, staff, hands, all the way down to the base. It is important to remember, these were intended for promotional use...Something to entice folks to visit the Skylanders section at the Toy Fair and something "physical" to send home to always look back on and remember the display and series. Everyone knows how big a fan I am of Terrafin and Warnado. There is a GITD Warnado that I've never seen, held, or thought of buying because of the crazy price. My life has gone on just fine. If Terrafin ever got a really cool variant I would love to find it, but if I came up empty I wouldn't think of spending a couple hundred to acquire it. You have to be smart with your money and keep it all in perspective. If you do pop for one that is sure to come up on ebay etc., I hope you get a fair deal. He does look awesome and this is really the first time I have seen a metallic in person, let alone in red. I don't think anyone would be disappointed in the alternative decoration here...it is very impressive. 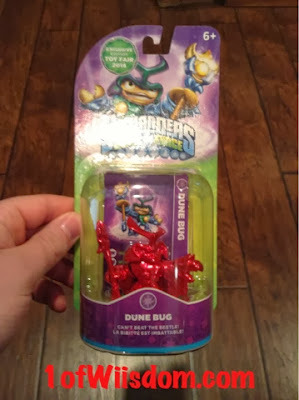 Hopefully this post has helped to showcase Toy Fair Dune Bug for you. 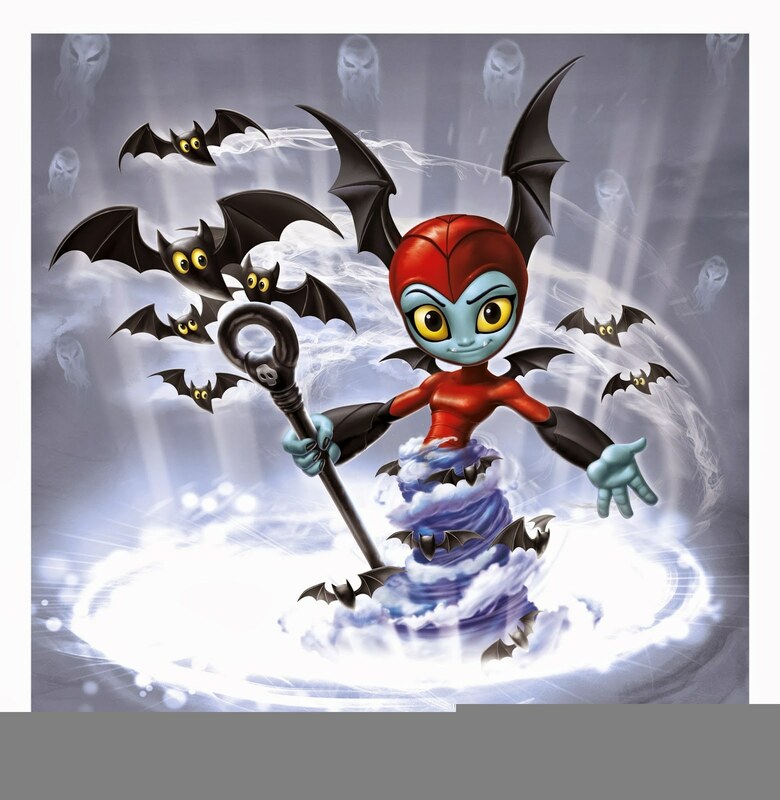 If you are bummed out about how hard he will be to acquire I can offer good news that Nitro Freeze Blade is coming soon along with some special Easter themed Skylander singles that include Fryno, Punk Shock, and of course in-game variant Spring Time Trigger Happy! 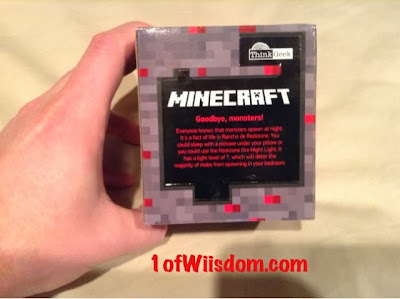 While making my usual rounds hunting for Skylander variants etc., I spotted this Minecraft Redstone Light from Think Geek. Technically they call it the "Light-Up Redstone Ore" but I think 99% of people would agree that "Redstone Light" successfully and succinctly describes this item best. 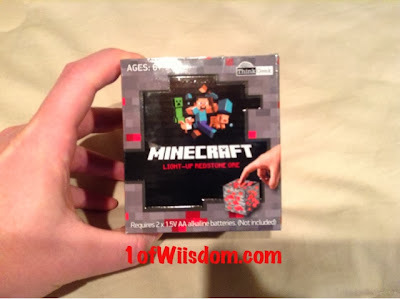 My Nephew, as you should know, is big time into Minecraft...given that it was red and that we have recently been playing around with Redstone, I figured it would be a cool Valentine's gift. The product was not priced on the shelf, but the nearby stickers seemed reasonable...I didn't know it was $25 till I got home. That is a higher price than you can get online at Amazon $22.49, or Think Geek at $19.99, but I suppose the fact it was there, I didn't have to pay freight, and I had it for Valentine's Day covers the premium. This is your typical novelty gift, but it seems to be well made and looks like it will give him years of enjoyment. My only concern is that the "tap" action isn't quite smooth...there is no set point to trigger a change and sometimes you can inadvertently do so, but all-in-all, I think that constitutes only a minor issue. The light itself is pretty cool. Don't forget that you need 2 AA Batteries and a small Phillips screwdriver to access the battery compartment. Once you have the power source in place you simply slide the switch to the "ON" position (it is tucked away nicely on the bottom side). 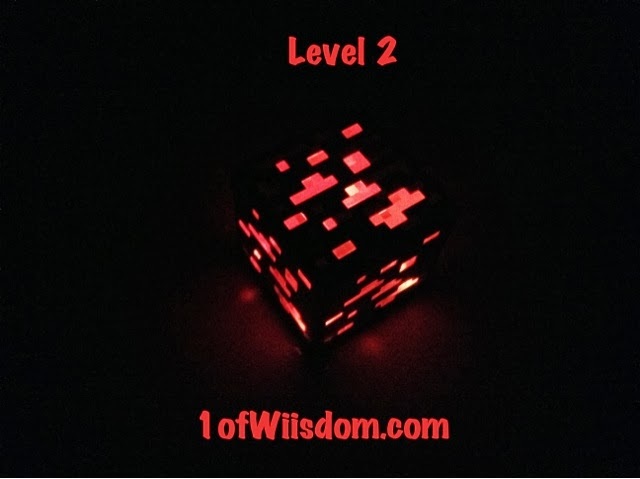 The cool thing is there are 3 levels of brightness that go from a dim glow all the way up to an impressive output of red. 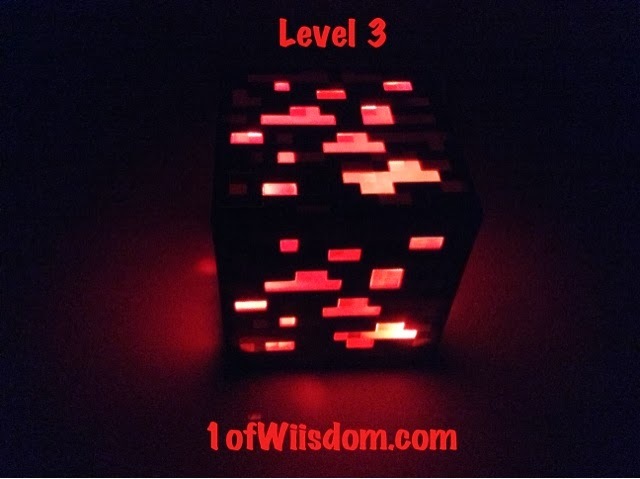 I don't think you'd want to read by the Redstone light, but it would work well as a night light, side table tap light, or just a really cool light up block at parties and get togethers. For the price, I think it is a nice item and should function as intended for years to come. 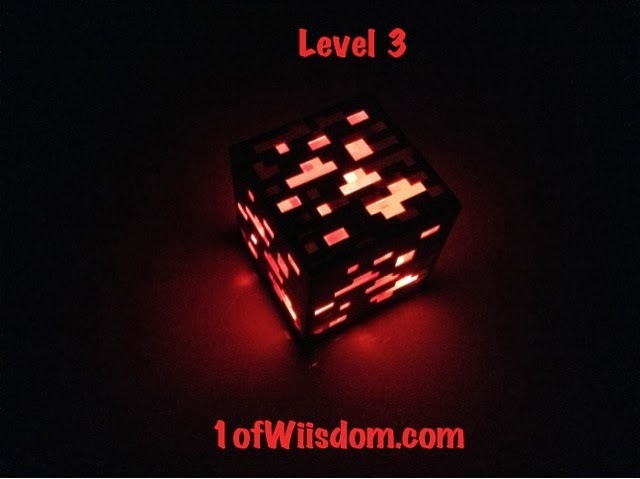 Below you can see the 3 different levels of brightness...If nothing else you know you've got a hit with any Minecraft fan and a sure fire conversation piece! 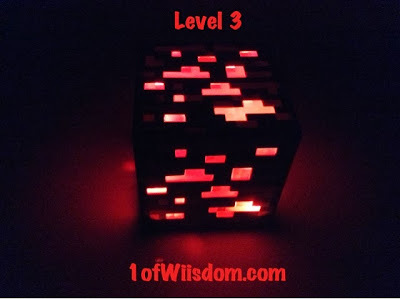 All-in-all I am happy with this Redstone light, my Nephew loves it, and I think it is going to look pretty cool in his bedroom. There is also a Diamond Light that I may pick up at some point in the future! Happy Valentine's Day and Happy Nintendo Direct Viewing! I had anticipated not only that we would get a release date for Mario Kart 8, but that we would see the actual Nintendo Direct right before Valentine's Day! I can get confirmation for this from a few folks I made the prediction too...Pretty cool go get both of them right! The worst news from the ND is that we have to wait until Friday, May 30th, 2014 for Mario Kart 8. The best news, imo, from the ND is that the Koopalings are going to appear as playable characters in MK8. If you haven't picked up on it yet, I am VERY EXCITED about Mario Kart 8. Without further ado, here are my quick notes from the broadcast...Please note they are just rough notes that I literally type out while watching the ND. 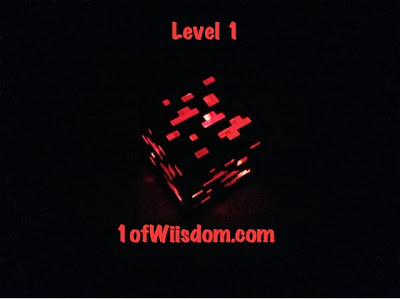 You can use them as a guide to where the info you might be most interested is within the video (it is fairly long at 40+ minutes). Little Mac joins Super Smash Bros. So, I have to ask, what are you most excited about? Today, February 9th, 2014 marks my 3 Year Anniversary on YouTube! I am typing this at 6 AM (not because I'm up early, but because I haven't gone to bed yet...although anyone that watches my vids regularly would already know that is how I roll), but look for a Channel Update later tonight as well as the release of some videos I've been saving! 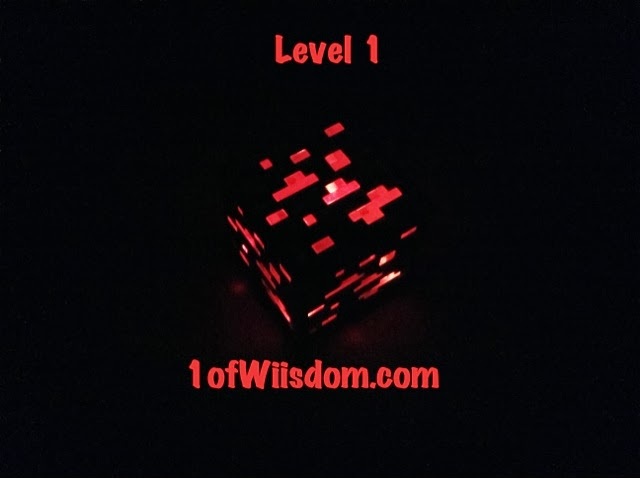 Thanks to everyone who has enjoyed the videos on YouTube, commented, subscribed, shared, etc...That is what I started the channel for to have fun and let others in on the action! It honestly began just because my Nephew and I wanted to record our Mario Kart Wii races (which were routinely, ridiculously epic finishes)...I was unaware at the time that it would snowball into what it has now become, but I wouldn't change anything. I'll cover the anniversary and a few other topics in the Channel Update and once it is LIVE I will embed it here.